Thanks to advances in technology, off grid power is a lot cheaper and easier than in the past. One area that barely changed for decades was generators. Since the time of Edison, it was straightforward: A mechanical power source turns a magnet inside a copper coil and creates electrical current. That changed with the introduction of inverter generators. 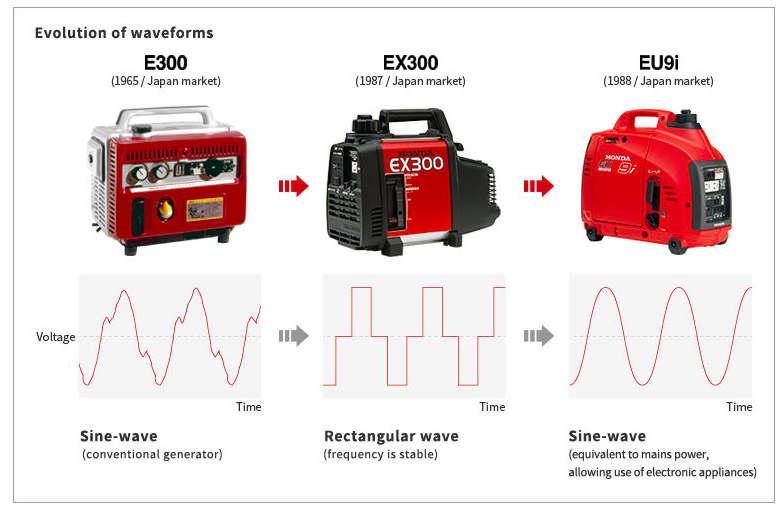 The earliest ancestor of inverter generators as we know them today was the Honda EX300, which came out in 1987. It had some shortcomings, the most notable of which was its square wave output. This limited its usefulness, and it was only marginally better than conventional generators. It took Honda just a year to correct the deficiency. In 1988 they released the EU9i which had a true sine wave output. Since then, the technology Honda pioneered has been replicated by dozens of manufacturers and inverter generators are now widely available. GRAPIC COURTESY OF THE HONDA CORPORATION. In previous Off Grid Ham articles, we discussed conventional generators and inverters. Inverter generators are a marriage of these two concepts. A mechanical engine still turns a magnet in a copper winding just like in the old days, except that in the case of inverter generators, the generator produces high frequency, three phase electricity which then goes through a two step process to become regular AC power like what you use in your home. 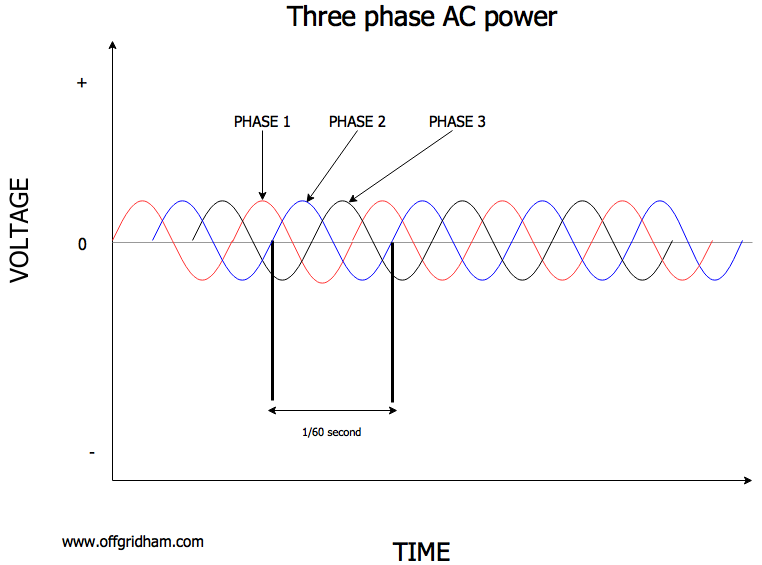 The three phase power is key to the function of inverter generators. The power in your house, and what comes out of inverters, is single phase. This term is just what it sounds like: A single sine wave that changes in a regular pattern with time and voltage. Three phase power is three sine waves or electrical signals overlapping each other. This provides more power in the same amount of time and is much more efficient. Notice in the three phase waveform diagram below that the voltage never goes to zero. The declining voltage or “valley” of one phase is filled in by the peak of another. Many industrial motors are designed to run on three phase electric but it cannot be used for ordinary consumer applications. Inverter generators convert the high frequency, three phase AC into DC current via a solid state rectifier, and from there the electricity goes into a conventional 60 Hz. full sine wave inverter not much different than what a lot of off grid hams already use. After that, you just plug your stuff in and power up. Inverter generators vs. conventional generators. Standard generators depend on the speed of the engine itself to create the single phase 60 cycle sine wave that all North American devices use. Each rotation of the engine produces one cycle. To produce acceptable 60 cycle AC, we need sixty rotations every single second, or 3600 revolutions per minute. Standard generators must maintain exactly 3600 RPM at all times, under all loads and conditions. This is usually done by mechanical governors that automatically adjust the throttle to maintain the speed. Some higher end standard generators have electronic engine controls or can run at slower speeds to get 60 cycles per second, but the basic idea of maintaining a constant RPM is the same across all versions of conventional generators. The drawbacks to this system are obvious: The purity of the power depends largely on the mechanical properties of the generator, and the inexpensive gas generators on the market today do not instill much confidence in their ability to deliver stable & reliable long term electricity. Any drift from that 3600 RPM speed will mess with the frequency of the line current. In addition, a small engine turning at 3600 RPM all the time will consume a lot of fuel, make a lot of noise, and need more frequent servicing. Imagine if you had to hold the gas pedal of your car to the floor and race the engine at its limit no matter how fast you actually wanted the car to go. Inverter generators solve many of these problems. Three phase power produces more electricity for each rotation, so the engine can be substantially smaller for the same output. More importantly, the engine speed is not critical. As the load changes, the engine can power up or idle down to meet the need. A smaller engine not having to “scream” at 3600 RPM all the time runs quieter. Much quieter. As the engine speed changes, the frequency of the three phase output will also change. As we already discussed, this would be a huge problem in a conventional generator, however, since inverter generators convert variable frequency AC into DC before going into an inverter, it does not matter. 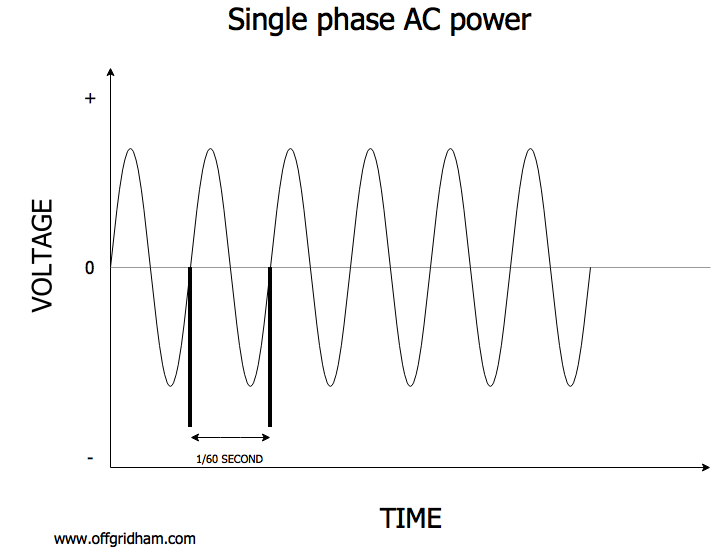 This is how inverter generators can produce a stable 60 Hz AC output even as the rotational speed of the engine varies. There are three huge advantages to using inverter generators. First, the efficiency. Unlike a conventional generator that has to turn at 3600 RPM regardless of the load, an inverter generator can slow down for light loads and throttle up when the demand is higher. This, in addition to having an engine that is smaller to begin with, translates into very high fuel efficiency. Typical 2000 watt inverter generators at 50% load can run about 8-9 hours on a gallon of gas; a comparable conventional generator will consume roughly 2.5 gallons of gas under the same conditions. The other big benefit of inverter generators is noise, or rather, the lack of it. Anyone who has ever used a small conventional generator knows they are obnoxiously loud! In a survival/SHTF situation where you do not want everyone for three blocks in every direction to know you have power, this is very problematic. Even under less critical conditions you’ll have to consider the personal comfort of yourself and others. Because inverter generators have smaller engines that do not constantly need to run full blast, they are inherently quieter than conventional models. They are so quiet you often can’t even hear them running until you walk right up to them! If stealth is a priority, then inverter generators are your only real option. Lastly, inverters have a significant weight and space advantage. With a smaller engine and more efficient three phase power production, inverter generators are substantially lighter and smaller than their conventional cousins. As an added bonus, parallel kits allow you to connect two small inverter generators together to act as one larger unit. This offers the flexibility of transporting the generators separately or leaving one behind if the power need is not great. With conventional generators, you’re stuck lugging that big single chunk of machinery around whether you need its full capacity or not. Not everything about inverter generators is awesome. There are some disadvantages that the radio amateur will need to be aware of before making a decision. Cost: There is no way around it. Inverter generators will cost at least twice and maybe up to eight times as much as comparable conventional units. The high tech used in the three phase system along with microprocessor controlled rectifiers and inverters all bump up the price point. The higher the power level, the greater the price disparity with 3600 RPM units. Limited capacity: If you need to produce a lot of power, then inverter generators may not be up to the task. The largest inverter generators top out at around 7 kilowatts (and will set you back an eye-popping $4000). Until the technology gets less expensive, inverter generators will have a practical limit of 3000 watts or so. This should be more than enough for most off grid amateur radio, but don’t count on inverter generators to run your welder or light up a soccer field. If you need more power then consider a slow turning (1800 RPM) diesel generator, which we’ll discuss in a future Off Grid Ham article. The 3000-8000 watt “doughnut hole”: Somewhat related to the previous point about capacity, there is a gap between 3000 and 8000 watts where inverter generators are either too expensive or do not exist, and slow turn diesel generators that are not readily available. If your power needs fall within this doughnut hole, then you may have no option other than a conventional “screamer” generator. Security/risk of theft: As an expensive power tool that is small, easy to carry, and has a high street value, inverter generators are a perfect cash crop for thieves. Stealing them is so common that aftermarket vendors sell antitheft kits specifically designed for inverter generators. If you own an inverter generator, be aware that you are a particularly desirable victim. Secure your assets and maintain strict operational security (OPSEC); do not shoot your mouth off to everyone about your cool stuff! They can’t steal what they don’t know you have. Honda was first to market with an inverter generator and since then everyone else has been playing catch up. Their venerable EU200i is the uncontested king of the hill and the one all others try to emulate. Currently selling for about $1000 each, they are a major investment, but with basic maintenance they will run for decades. Inverter generators are sold under literally dozens of brand names. Some are very competitive with the EU200i in price and build quality, but the market is also flooded with cheap knockoffs. All of them will work well initially. The difference is that the low end inverter generators will begin to have problems after even moderate use because manufacturers cut corners to keep the cost down. You really do get what you pay for. Because of the technical complexity of inverter generators, do it yourself fixes are difficult if not impossible. My advice is to “buy once, cry once” and spend more on a solid unit that will not break down in the first place. There are tons of on line reviews and YouTube videos for pretty much every inverter generator on the market, so do your homework and don’t settle. If you want to avoid hours of sorting through confusing reviews and data, skip to the end and get any of the generators in the Honda EUxxxxi product line. While you’re at it, also get an extra spark plug or two, a quart of oil, an air filter, and a fuel filter. With these modest provisions you should be able to keep your Honda running for years. Key Points –what you need to know about inverter generators. They operate on a three phase system which is more efficient than traditional 3600 RPM generators. They do not need to run at a constant speed all the time, which saves fuel. They make substantially less noise than conventional 3600 RPM generators. They are light and a great portable generator for any scenery. Uses include, garage power, camping holidays and many more. Because they are light, portable, and have a high street value, they are at extra risk for theft. They are very expensive compared to conventional generators. 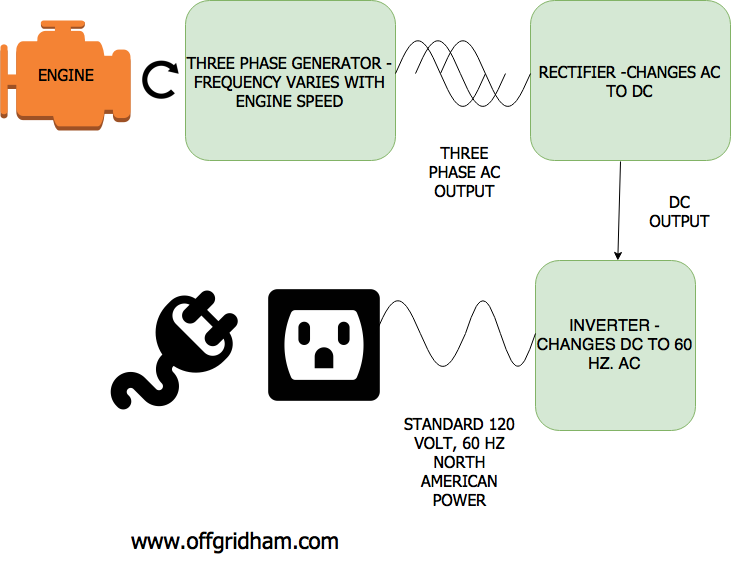 This .pdf by the ARRL gives additional background about inverter generators. This Honda web page has an interesting history of inverter generators and explanation of their current technology. Inverter generators are a big investment but when properly selected will provide years of quiet, reliable power. Understanding how they work and their advantages and disadvantages will help the radio amateur better plan for off grid power needs. Good information, and nice work on the original graphics, Chris. Size, weight, and reduced sound make these very attractive in an urban environment- to say nothing about their higher efficiency. Cost is definitely a barrier. I worry about theft of my heavy old 4kw unit where it would take two guys with a nearby truck to haul it away. These inverter-generators could be snatched by a lone thief and you wouldn’t even miss the noise since they are so quiet to begin with. Thx. Thanks for the feedback, Mike. A 2000 watt inverter generator weighs about 40 pounds and is roughly the size of an airline carry on bag, so it would not be a big chore to rip one off. All my generators have cable locks on them. Although operational security was not the topic of this article, it is very important and will go a long way in keeping your stuff from being heisted. Good stuff. We need more good reads like this. Thanks for the support. I hope you’ll stop by again soon! I’m a newby to camping. We are about to purchase a 23 foot travel trailer and we’d like to boondock or off the grid camping too when we get used to the ordeal lol! I’m thinking of getting a 6300 watt Yamaha Inverter generator for this. In addition to that thought…my brother wants to sell me his brand new Ridgid 6800 watt generator, (not an inverter type) for close to what he paid for it. It really hasn’t even used it. He just wanted it if the house power went out but he really doesn’t have room to store it. I thought about a 4500 watt Yamaha Inverter gen too but an RV dealer salesman said he’d get even a bigger one, this is why I’m considering a 6300 watt Inverter gen. I’m not planning on adding more batteries than the 1 that goes with the camper. Any suggestions for this camping dummie? Hi Gary, thanks for stopping by Off Grid Ham. As you probably already know, a 6300 watt inverter generator is going to cost you some serious money. If you want the best and have the cash, then go for it. Although I personally prefer and recommend Hondas, Yamaha is also a solid product and I’m sure you’ll be very happy with it. However, I question if you really need a 6300 watts in a 23 foot camper. For powering a few lights at night and some small appliances, you should be able to get away with a smaller and less expensive model unless you expect to be running an AC unit or other heavy stuff. Keep in mind that the RV salesman…is a salesman! I when I test run my generator for my house I can typically keep my entire consumption around 2000 watts or less. That includes a full size refrigerator and a forced air furnace. As long as everything does not turn on at the same time, I’m good. I have a large conventional generator and I hardly ever come close to maxing it out unless I’m running my welder. Your brother’s generator will technically work. My only concern is that conventional generators are quite loud and go through a lot of fuel. if you really do use a lot of watts, at 50% load (3400 watts) the Rigid generator will go through about 5 gallons of fuel every twelve hours. A weekend trip to the “boondocks” would mean lugging along twenty or more gallons of gas. Are you sure you want to do that? And put up with the noise? My advice would be to carefully calculate how much power you will need for the camper and get an inverter generator appropriately sized for the load. Alway buy a little more power than you need. A large generator running under capacity is better than one that is just barely big enough running “balls to the wall”. I hope this is helpful; please contact me again if there are other questions. Miller Trailblazer 325 is an economical dual purpose welder/generator. When the Honda inverter/generators came along the EU7000is inverter generator made possible more economic off grid power. Our off grid use is about 6Kw so the Trailblazer loafs along burning I’d guess twice the fuel the EU7000is will. The big problem for generators is maintenance. Don’t believe that oil level sensor will save your generator from seizing! An hour meter and usage log should be maintained. Generators, an off grid power solution, has been around since the 1980s, and much hasn’t changed since. However, it is not to say that their use has become obsolete. Rather, because they had created such good technology, it is still useful today. They are still very efficient to use, and they are quiet, compared to other kinds of generators which are noisy, and can cause disturbance to neighbors. and they weigh much lighter than other kinds of generators. They have a smaller engine, but that doesn’t mean that they produce weaker power though. They are currently sold at about $1,000, and is worth the money if you are looking for an external source of power. Inverter generators are best generators. Efficiency, quiet and light in weight are the best quality of inverter generators. But the biggest disadvantage is cost. It is expensive than conventional generators. Price should be less expensive so that many people can buy it. Ryobi has a new 2,300 watt inverter generator selling for only $600, a big discount from the Panasonic price tag of $1000. I’m a big fan of other Ryobi products; I have 8 or 10 of their battery powered devices – circular saw, drill, leaf blower, reciprocating saw – and they’re terrific. Any assessment of their new generator? Hi Patrick, thanks for your question. I have no experience with the Ryobi generator, but they are a well known brand that has been around for a long time. They get good reviews on line and are very well priced. In my opinion, the Honda is still king if you can afford it. Beyond that, do your homework and get as much bang for your buck as you can.